"Dr. Mun's latest book is a logical extension of the theory and application presented in Real Options Analysis. More specifically, the Real Options Analysis Course presents numerous real options examples and provides the reader with step-by-step problem-solving techniques. After having read the book, readers will better understand the underlying theory and the opportunities for applying real option theory in corporate decision-making." -Chris D. Treharne, President, Gibraltar Business Appraisals, Inc.
"This text provides an excellent follow up to Dr. Mun's first book, Real Options Analysis. The cases in Real Options Analysis Course provide numerous examples of how the use of real options and the Real Options Analysis Toolkit software can assist in the valuation of strategic and managerial flexibility in a variety of arenas." -Charles T. Hardy, PhD, Chief Financial Officer & Director of Business Development, Panorama Research, Inc.
"Most of us come to real options from the perspective of our own areas of expertise. Mun's great skill with this book is in making real options analysis understandable, relevant, and immediately applicable to the field within which you are working." "Mun provides a practical step-by-step guide to applying simulation and real options analysis-invaluable to those of us who are no longer satisfied with conventional valuation approaches alone." In his groundbreaking book Real Options Analysis, real options expert Johnathan Mun provided a qualitative and quantitative description of real options, the methods used in solving them, why and when they are used, and the applicability of these methods in the decision-making process. Now, in his latest endeavor–Real Options Analysis Course–Mun sets out to help you truly optimize the use of real options in the decision-making process, through an in-depth discussion of real-world business cases and innovative real options software applications. 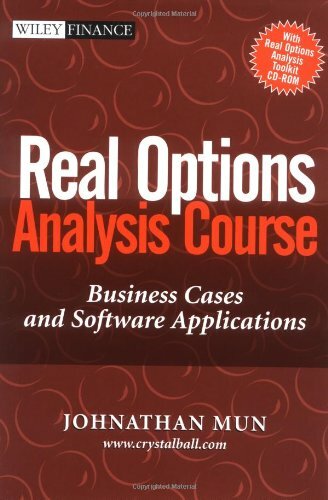 Real Options Analysis Course opens with a clear introduction on how to get started with the Real Options Analysis Toolkit (limited edition) included on the companion CD-ROM. Easy-to-follow directions allow you to set up and familiarize yourself with this cutting-edge software, which features seventy different real options functions, thirty-three models, easy-to-use templates, and a powerful graphical interface–all powered by Crystal Ball®. Once you’re up and running, Real Options Analysis Course lays the groundwork for the numerous business cases that will be explored later on in the book. First, you will become familiar with the seven simple stepwise procedures used in setting up and solving a real options problem. Then you’ll receive a refresher course on the basics of financial modeling–Monte Carlo simulation and volatility estimates–as well as the basics of real options, from binomial lattices to state-pricing approaches to solving a European option. Real Options Analysis Course provides a cutting-edge view of evaluating and valuing capital investment strategies by taking into consideration the inherent real options embedded in the strategic decision-making process. Combining expert advice and in-depth business cases with innovative real options analysis software, Real Options Analysis Course will help you identify, prioritize, value, and manage strategic opportunities better than ever before. DR. JOHNATHAN MUN is Vice President of Analytical Services at Decisioneering, Inc., the makers of Crystal Ball® analytical software. His duties focus primarily on heading up the development of real options and financial analytics software powered by Crystal Ball®. Prior to joining Decisioneering, he was a consulting manager and financial economist in the Valuation Services and Global Financial Services practice of KPMG Consulting, and a Manager with the Economic Consulting Services practice at KPMG LLP. During his tenure at KPMG Consulting and at Decisioneering, he has taught, advised, consulted, and applied real options analysis at multiple firms including Unilever, BP, Credit Suisse, Motorola, Intel, and El Paso Electric. He is also currently a visiting professor in finance, economics, and statistics at various universities, including University of Applied Sciences (Germany), Swiss School of Management (Switzerland), and Golden Gate University (California). Mun is the author of Real Options Analysis, also published by Wiley. He continues to offer worldwide seminars and lectures on the topics of real options, simulation and risk analysis, and corporate finance.